We're sure there's no problem in going back to learning chess from the start if we have a sweet chess teacher as this! 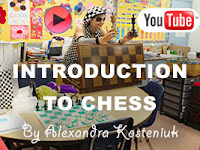 A special video: An introduction to chess for a Kindergarten class in the United States given by Chess Queen™ and 12th Women's World Chess Champion Alexandra Kosteniuk. You can contact Alexandra Kosteniuk directly at chessqueen@me.com for questions! Read the original post on the video by the World Champion at www.chessqueen.com.